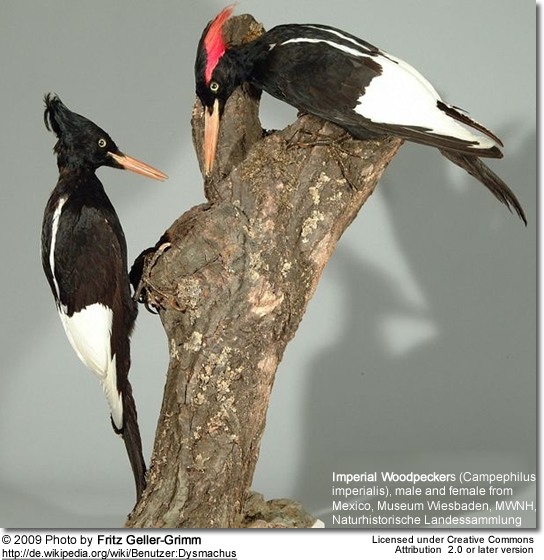 The Imperial Woodpecker (Campephilus imperialis) was a member of the woodpecker family Piciformes. It was the world's largest woodpecker species. This 60 cm (23 in) long bird is officially listed as "Critically Endangered (possibly extinct)". However, the last positive sighting was in Durango, Mexico in 1958 and it is probably now extinct. The primary reason for its decline was loss of habitat, although it was also set in motion by over-hunting. The male had a red crest, but was otherwise black, apart from the inner primaries (longest wing feathers), which were white-tipped, and white secondaries (shorter, upper "arm" feathers). The female was similar but the crest was black, not red. It was once widespread throughout the Sierra Madre Occidental of Mexico. It preferred open forests made up of Montezuma Pine. It fed mainly by scaling bark from dead pine trees and feeding on the insect larvae found underneath. A mating pair required a very large area of untouched forest to survive. Given the near total destruction of its original habitat, and the lack of any confirmed sightings in almost 50 years, many ornithologists believe the Imperial Woodpecker must be extinct. However, there have been a handful of more recent, unconfirmed sightings. Most recently, in 2005 two birders from Mexico reported a sighting of a bird which could be a female Imperial Woodpecker, claiming that they observed that bird for two minutes on a pine at Divisadero on the north rim of Copper Canyon (Barranca del Cobre), Mexico. This sighting has not been confirmed. The Imperial Woodpecker's closest relative is the similar but 20% smaller Ivory-billed woodpecker, which is also critically endangered or extinct.